Do you have chronic kidney disease, or kidney stones ? Your doctor told you there is no cure, right ? Well, there is a cure ! And this book brings you the details of that cure so you can cure yourself. 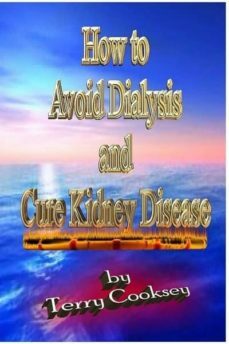 This book gives you two ways to avoid dialysis AND the way to cure yourself of chronic kidney disease and kidney stones naturally as the author did ! This book is NOT about gimmicks. The cure for kidney disease is proven science that your doctors COULD tell you, but dont ! By doing what this book says, the least you will do is greatly improve your health. There is no other book available that gives you the information that is in this book. This book empowers you with the knowledge to save your own life and cure yourself of chronic kidney disease, Diabetes, Gout, Heart Disease and Kidney stones. And for the rare few who do not, the least you will do is significantly improve your health. This book is not from some author who picked this book to be his next subject to write a book about ! No, this book was written by a man who had to learn these things he shares in this book just to save his own life ! After doctors diagnosed him with chronic kidney disease, he was told he would be on dialysis or dead by 2008 or 2009. And without any help for his kidneys from the medical profession, he used himself as the guinea pig to see if he could make his kidneys better and thus, save his own life. This book tells you how he succeeded at that !